Lucky for him, everything was labeled. Good luck finding that on a Toyota or Ford. Awesome hack! But I have to disagree that its expensive to find aux in adapters. I use these and they work great in just about any vehicle. I’VE HAD FOUR OF THOSE AND THEY ARE ABSOLUTE JUNK. YES CPS LOCK WAS NEEDED. @cde, Radios aren’t terribly difficult to reverse. They all have the same functional blocks and the amplifier chips are easy to find. If you can power the radio on the bench and work from the amp back, injecting a signal from a generator….. No problem assuming you have the equipment and the motivation to do it. The equipment I have….. I’ve added inputs to a couple boom boxes, but I probably wouldn’t be motivated to uninstall the radio, do the work, and put the same one back in. None of my factory radios were worth the hassle. @cde Just look for two same value caps coming from the FM input, these will be the left and right channels. I assume you are in the USA but if you go to http://www.jaycar.com.au/search?text=3.5mm+stereo&CSRFToken=799834a5-b675-4380-b785-0101c02395fb you can see what socket you need to buy from whatever store in the US. If you look at the stereo socket from the solder tab side with the 3.5mm connection facing up, the pin connections need to be (clockwise from top) 1: Ground, 2: Left Channel to Stereo, 3: Left Channel from Radio, 4: Right Channel from Radio, 5: Right Channel to Stereo. Regarding where to connect them to the board, the picture at the top of the thread almost says it all. The two thin tracks (going to the pads where the yellow and brown wires have been soldered) have, by the look of it, been cut. I am assuming that the two left-side wires (yellow and brown) are the radio outputs which would make the violet and orange wires the stereo inputs. It could be the other way round – once having got the assembly out it would be trivially easy to try them the other way.The green ground wire is soldered to the big ground plane. I plan to do this on my 2003 Gen 4 Outback. @ Mojoe, that’s what I’m referring to. While difficulty in reverse-engineering the radio is subjective, this is essentially the ikea furniture version of it. Full reverse-engineering is like building a china cabinet from scratch. Basically, a caveat emptor to others who want to do something similar to different make radios, that it won’t be soo easy. Soldering is meh. Almost bridged to a trace. Sorry…Sorry everyone…QC, just got home from work. Hey man I totally did this with my 1979 Dodge pickup truck’s radio. I lol’d when my friend who drives a civic raged when he saw it. @injulen I have yet to find a reasonably priced transmitter that doesn’t sound like complete garbage. I even modded one with a better antenna and quadrupled the range, but unfortunately it still sounded terrible compared to a direct connection. It was digitally tuned with presets and all. I also find the ones like you linked, to be too obtrusive. They hang way too proud out of the lighter socket. Maybe I’m just too damned picky. Awesome, this gave me the motivation to do my stereo. Soldering irons already warming up. I remember a guy I knew in high school had a similar setup in his family’s van. His dad, an electrical engineer, rigged it up using a switched 1/8 jack, so that it would function normally until you plugged something into the jack. Pretty spiffy to have back in the 90s. Great minds must think alike– I just performed a similar modification to my 1999 v6 Accord LX. The only problem is that those Subaru radios are the worst sounding piles of crap I’ve ever heard. I did something very similar to an old boombox stereo from the 90’s, it only had a tape deck and AM/FM radio but the sound was good, so I wanted to add AUX in. I didn’t want to damage the tape deck or radio in the process though, and other tutorials I had seen involved hacking the tape deck head’s feed. 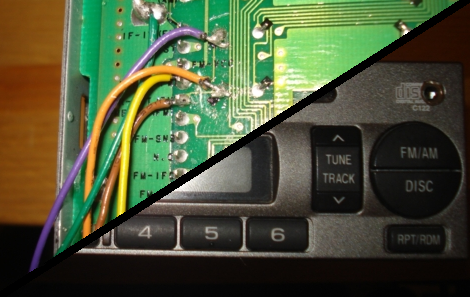 Instead, I noticed that my stereo had a ribbon connecting the main PCB and a second PCB which appeared to contain the tuner module. Luckily all the wires were labeled (L/R/GND/etc) on the PCB’s so it was a simple matter of splicing in and sticking a DPDT switch to switch between AUX in and the existing radio. This works perfectly, the radio is still functional and I can even record the AUX input to tape if I really needed to. Also one of my first successful hacks. the fooling part you sometimes there is a mute pin on the pre amp or main amplifier chip. if you have a logic probe or a good multi meter it is possible to monitor each pin until you find the one that either goes 0 or 1 when the sound comes on. if it is a 0 when on you can short the pin to ground. if it ia 1 you may have to short 5 volt power to the mute pin (it is possible you may even blow the mute output on the chip that drives the mute input (that’s ok since you want the sound on possibly permanently)). yes that’s right there should be a 5 volt source for the logic maybe possibly 3.3 volt since it is a fairly late technology. if you are looking for normal line level then tap directly to the inputs on the main amplifier chip. if you are looking for phono or microphone level you will need to tap the head pre amp on the tape deck. I did this with my 2000 Mustang. The early 2000’s Mustangs had a separate CD player from the head unit, with line level audio going between, so after some testing and researching, I isolated the required wires and put in a 1/8″ jack. After this stage, though, audio would only pass if the CD-Player was actually playing, so I had to put a CD of 78 minutes of nothing in the player. Later, I got tired of this dance, and decided to go all out. I bought the iPhone AV kit, wired it over to the left pillar of the windshield, and installed a mount. The audio got connected in the same way as before, but I added a switch negating the need for the blank CD. Then I took the USB on the AV kit and spliced the power to make a cigarette lighter behind the dash, where I plugged it in. Because the power isn’t clean, it creates a buzz, which I fixed by adding a switch for power. I’m still looking for a filter (either on the power or on the audio) that can get me cleaner sound with the power on. The radio also has that module on a kind of metal cage. It stopped tuning FM and AM, all I hear is static. It goes through all frequencies but it doesn’t tune. Perhaps I need to look into that module. Anyone knows what do I need to look into? I’ve looked into it and I’ve seen nothing melted (like capacitors or resistors). It would be cool to restore it because it mantains the car’s original look. is there a cheap usb host mp3 player one could integrate into a car that already has an aux port? I did this hack the other day, it took about 45mins in a shop that had all the necessary tools (soldering iron, drill, screw drivers) to do it. Works great without any static. In all it cost me around $3.00 for the plug with shipping and my time to install this in the radio. anyone have the instructions on how to do this to a simple AM/FM radio out of a Ford crown victoria.